Plastic luggage carrier in polypropylene for kid's bicycle. It has 2 holes to be assembled to the frame. It measures mm.300x110. Little front basket in polipropilene. We can sell it with plastic strips for nylon bicycles or with metal galvanized stirrup for sphere bicycles. Maximum measures mm 200x110x140 (h). Sheets of decals with colorful stars of various sizes, to be applied to front baskets art.11 and art.22. Front basket of cage design for baby bicycles with lateral hooks for fixing at the handlebar of about mm.22 diametre. It is made of polypropylene. 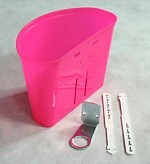 Rectangular baskets pair in polypropylene,for kids bicycles. The front one, art.82, has 3 hooks to fix it to the handlebar and place for stickers. The rear basket, art.54, has 4 hooks to fix it to the luggage van. 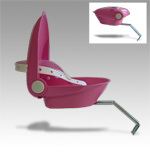 Babycase (max measures 220x140x90 mm. closed) with sliding mechanism on galvanized steel bracket without using screws. Single color, bicolor or tricolor. BOY VERSION. Dollholder-Babycase (max measures 220x140x90 mm. closed) double use with sliding mechanism on galvanized steel bracket without using screws. Single color, bicolor or tricolor. GIRL VERSION. Front basket cage design in polypropylene for kids bikes. Frontal space for stickers. It has a reinforced hook for fixing at the handlebar of a diametre till mm.22. Round front basket in polypropylene, a strong and flexible material. It has 3 hooks to fix it to the handlebar and lateral place for stickers.